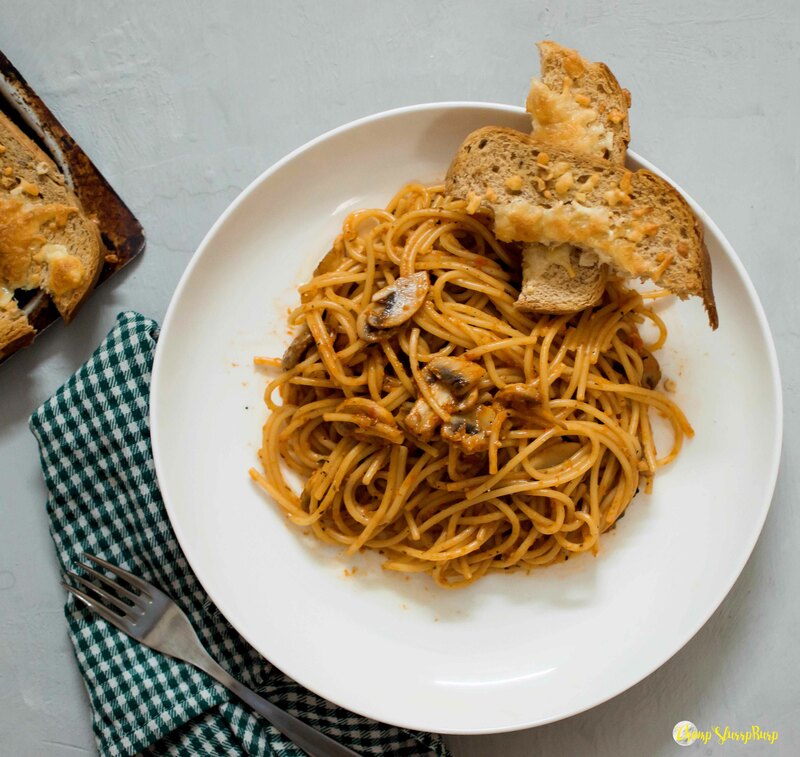 Roasted red bell pepper spaghetti - CHOMP! SLURRP! BURP! I have seen so many recipes involving roasted bell pepper sauce and have always been fascinated by this chunky, flavorful sauce. I faintly remember trying this long back but got it bang on right this time. 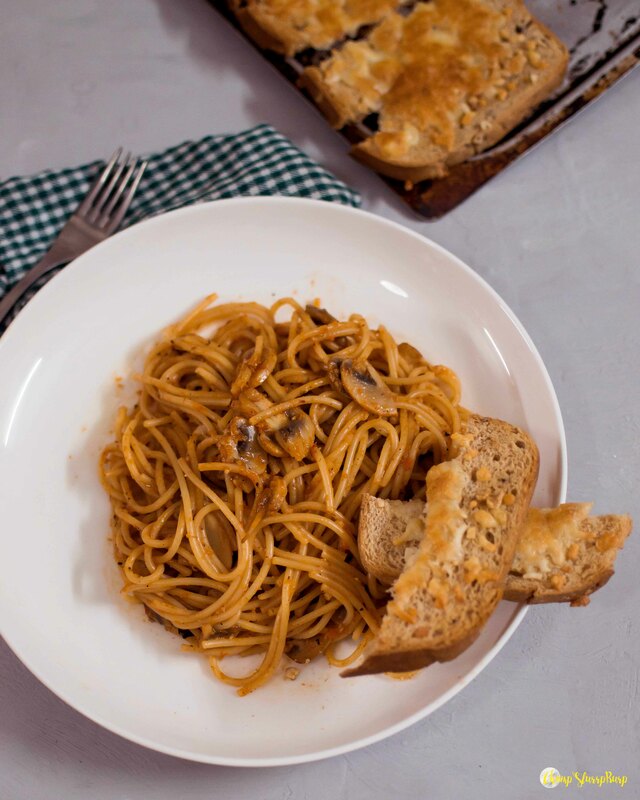 A chunky, smoked sauce, al-dente spaghetti, loads of button mushrooms and cheesy garlic bread. 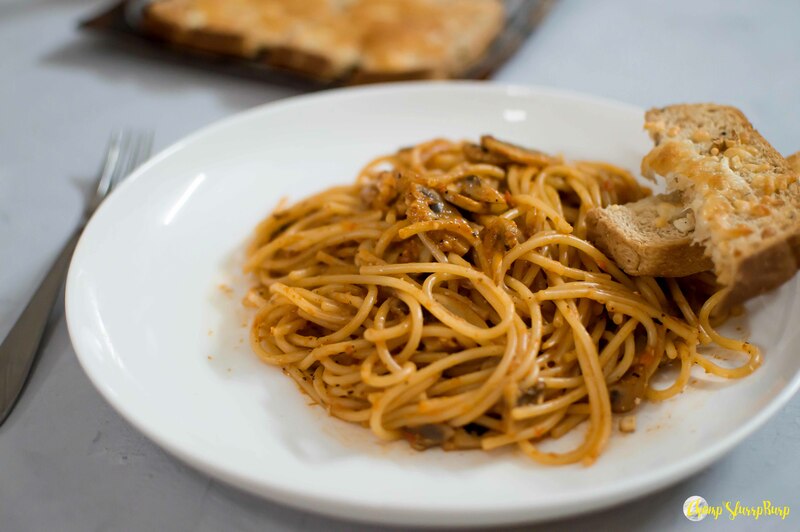 Fill a deep bottom pot with water, add 1 tsp salt and the spaghetti and bring to a boil. Cook the pasta till done al dente. Meanwhile, wash the bell pepper and pat dry. Put the stove on medium flame and carefully place the whole pepper on. Heat slightly till it gets slightly smoky. Carefully turn it so it is charred on all sides. Remove from the heat and let it cool down. Peel the garlic cloves and chop 4 of them roughly for the sauce. Thinly slice the other two cloves for the pasta. Once the pepper has cooled down, peel the charred skin, deseed and remove the stem. Roughly cut the pepper. Heat 1/2 tsp oil in a pan. Add the garlic set aside for the sauce and the pepper. Toss for 2-3 minutes. Remove from heat and transfer to a blender. Add the milk and blend till smooth. Wash the mushrooms and chop the mushrooms. Microwave for a minute on high and drain the excess water. Add 1/2 tsp oil in the pan, add the mushrooms. Cook for 2 minutes. Add the sauce, chilly powder, and salt. Cook for 5 minutes. Add the pasta and toss the sauce and pasta are mixed well. Top with Oregano seasoning. For the garlic bread, slice through the bread pieces, top with cheese and chopped garlic cloves. Bake for 5 minutes until crispy.